The Nodal axis travels backwards through the zodiac at 18 months per sign, pulling twice yearly solar and lunar eclipses with it as it goes. The final eclipse of the Virgo/Pisces season fell on 26th February 2017 at 8.12 Pisces. That season began on 20.3.2015 with a solar eclipse at 29.27 Pisces. The new Leo/Aquarius eclipse season started just after midnight (GMT) on 11 February 2017 with a lunar eclipse at 22.28 Leo – running right through to the last in the season, another lunar eclipse at 0.52 Leo on 21.01.2019. What does it all MEAN, though? A quick trawl through google will reveal dozens and dozens of astrology sites offering all kinds of opinion. It seems that we humans still get excited by eclipses, which have been dredging up fear, excitement, anticipation and predictions since the earliest days of civilisation if not earlier. I can still clearly recall the fuss, during the last Leo/Aquarius eclipse season, over the Big Solar Eclipse of August 1999, which picked up on a great deal of collective fear as the Millennium approached. Predictions, from the end of the world as we knew it to Paris going up in flames, ran rampant. As you may have noticed, the world is still here, and we still have Paris. If you’d like to read what I wrote about it all then, just click HERE. How, then, do we make sense of eclipses and relate them to our own lives in ways which are going to be useful? There are choices to be made regarding this question. My own view, for what it’s worth, is that getting worked up about individual eclipses is all very well, but we need to put some kind of context in place for the information we extract to be of much value. 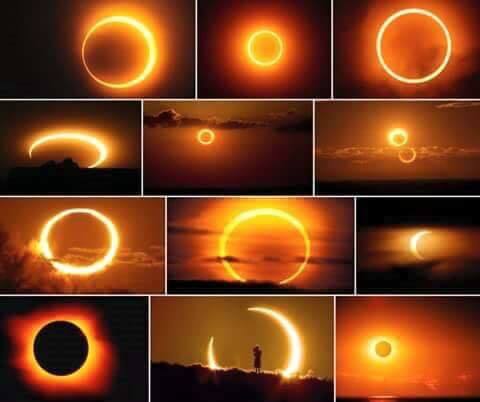 The biggest possible context is that of placing the 2017-9 Leo/Aquarius eclipses in the context of the Saros Series of eclipses, which run in vast energy waves from North to South across the globe, repeating every 19 years, for varying periods of up to a thousand years or more. Each eclipse belongs to one of the Saros Series families of eclipses, each of which has a specific core meaning rooted in the very first eclipse of that particular series. If you want some in-depth research by Dr Bernadette Brady, the book to acquire is “Predictive Astrology: The Eagle and the Lark . A free 17 page download introducing the Saros Series is also available from her website HERE. If you don’t quite have the time, energy or inclination to pursue this truly fascinating context, then the next one to consider in which to set this Leo/Aquarius season, is the 18.6 year returning cycle of the Moon’s Nodes, which governs the appearance of both solar and lunar eclipses. As the Nodal axis regresses through the chart, identifying via the highlighted houses the overall territory up for change, the transiting eclipses function as “battery chargers”, gradually building up the energies of our lives in preparation to receive major change. An image comes to mind here from the female menstrual cycle, of the egg gradually being primed and prepared until it is at its maximum point of readiness to receive the male sperm, conceive and begin new life. I think the eclipses begin their work of charging-up as soon as the relevant eclipse season begins, which may be as long as eighteen months before the turning point(s) in life appear. The really powerful “major” times in life are characterised by not just one or two, but a cluster of transits and/or progressions involving the natal, and/or progressed, and/or transiting Nodes.The outer planets, especially Pluto with its strong “fated” feel, stand out. To read the research on which I based those conclusions, you can download my book The Moon’s Nodes in Action for free. A powerful recent example of this can be seen from the the Virgo/Pisces season, which began on 20.3.2015 with a solar eclipse at 29.27 Pisces, and ended with another solar eclipse on 26th February 2017 at 8.12 Pisces. As the Moon’s North Node retrograded through Virgo, pulling the eclipses with it,and connecting with the Saturn/Neptune square which transited 10-15 degrees of Sagittarius/Pisces from November 2015 to its last exact square in September 2016, those powerful, difficult energies triggered the natal Uranus conjunct Pluto in Virgo opposite Chiron in Pisces natal configurations of people born from 1963/4 right through to 1968. Many people had a particularly difficult time during 2016 as a consequence of being ‘plugged-in’ to this energy pattern combining natal planets, Nodes, eclipses and Pluto and producing events of a life-changing nature in many cases. I saw this in a number of clients’ charts and lives, in members of my own family – and their challenges directly impacted on me, since I have 9 Virgo/Pisces as my Ascendant/Descendant degrees. The dominant transiting pattern for 2016 was Saturn in Sagittarius, squaring Neptune in Pisces. Everyone with planets/Asc/MC/ Nodes/Chiron in the early to middle degrees of the mutable signs triggered by this Saturn/Neptune square would have found 2016 tougher than usual, with family of origin pain, loss, low energy, confusion re life direction, and often, health issues in the mix. What lies ahead for this 2017-9 Leo/Aquarius eclipse season? 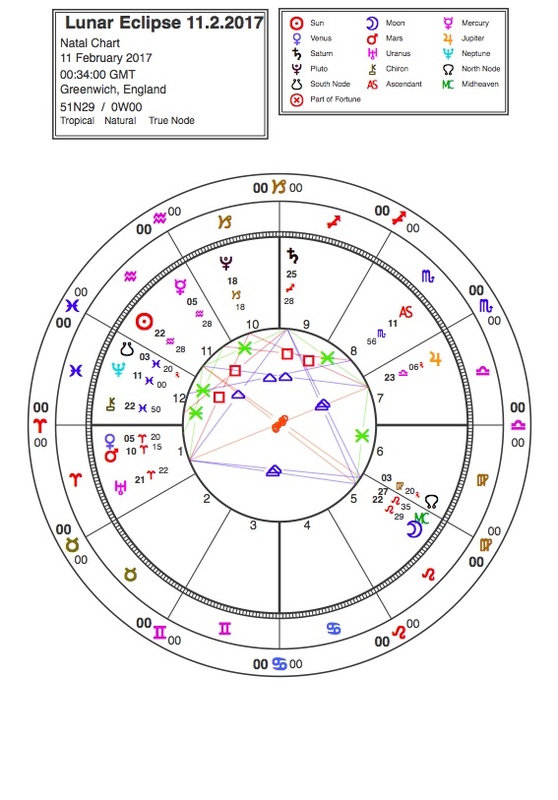 Overall, the birth chart for the starting eclipse of this season looks altogether more buoyant than the preceding Virgo/Pisces one. For starters, Nodal/eclipse energies are moving from earth and water to fire and air, lightening things up and bringing in greater potential for moving forward as a result of creative opportunities coming our way through group contacts, if we are ‘plugged-in’ to the Leo/Aquarius axis via planets in our birth charts. As can be seen from the above chart, there is a Grand Kite pattern draped around a Jupiter/Uranus opposition. As the Nodes and eclipses regress through Leo/Aquarius, they will be picking up that opposition, and Uranus’ trine to Saturn, sextile Jupiter, for much of 2017. So – a combination of restless desire to break new ground via the Jupiter/Uranus opposition, held in check by Saturn and offered fruition by the Jupiter/Saturn sextile,was the prevailing Nodal/eclipse pattern for 2017. 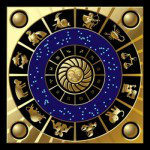 Since the North Node always pushes us to be the best we can be, and this North Node is in Leo, have a good look at the pair of houses which will be highlighted in your horoscope by the North and South Nodes and their attendant solar and lunar eclipses. These are the areas continuing to be up for major change as 2018 unfolds.